Majnu ka Tila or MKT as we called it in college, is a Tibetan refugee colony tucked away in the by-lanes of North Delhi. What it offers is an insight into the exuberant culture and food of Tibet. Bustling with people at all times of the day and night, the narrow lanes are almost always under a flooding crisis but it doesn’t stop the hawkers from selling little trinkets, Tibetan prayer flags, colourful woollen caps and gloves. Every once in a while you bump into a beautiful Tibetan temple with puppies playing in front of it. The food in MKT is best represented by two of my favourite joints called by almost the same name – AMA Café and AMA Restaurant. AMA Café has the city’s best pancakes on offer. They can be customized according to your taste but being a traditionalist, I go for the banana and Nutella variety. The pancakes are fluffy but not bread-y which is key in pancake making. They are only available till noon so get there early and stay put for the rest of the day. The Apple Pie is another beauty; crunchy crust and soft and crumbly on the inside, it is a scrumptious dish. The décor is bright and fun with Tibetan motifs and photos on the walls and travel books on shelves. It is a great place to sit by yourself next to a window on a winter afternoon, sip a cup of coffee, watch the hustle and bustle down the street and try to get some work done. After spending most of the day at AMA Café and hopefully catching up on work, move over to the AMA Restaurant down the lane. Comfort food for me is mostly a plate of rice and stir fried chicken or a hearty bowl of meat soup. All and any combinations of Chinese food can get me out of a bad mood and the AMA restaurant serves some of the most affordable and delightful Chinese and Tibetan food in town. The place by itself is basic and not as pretty as its sibling but food is a showstopper. 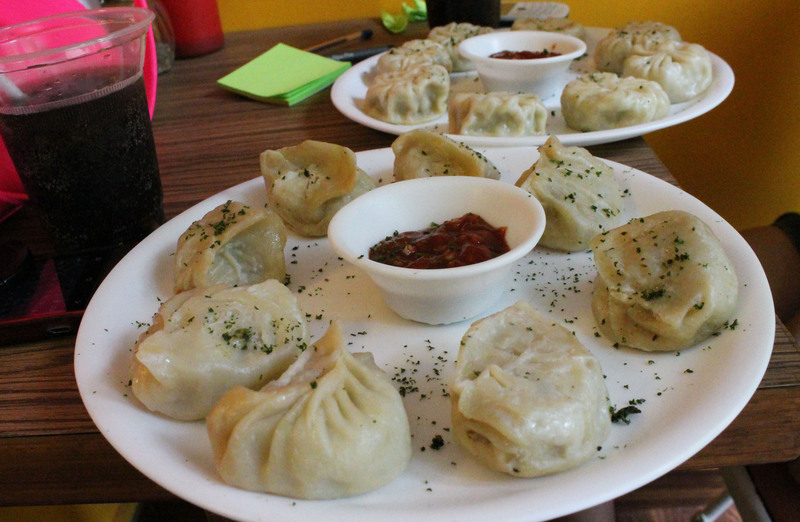 The Momos and Chilli Potatoes are mandatory eating and without a doubt lovely. For the main course, go for Chicken or Buff Thupka and Spicy Fried Pork with Steamed Rice. The pork is succulent and sweet, a taste you will remember long after it is gone. The food is not for the weak of stomach. Go with agreeable company. Eat at leisure. Return a happier person.